In practice for over 30 years, board certified podiatrist Brian Goldstein, DPM of Goldstein Podiatry strives to provide the highest quality foot and ankle care to patients. Serving the communities of Wynnfield, Narberth, Penn Valley, and Bala Cynwyd, PA, Goldstein Podiatry offers treatment for all general foot and ankle conditions, including heel pain, gout, ingrown toenails, and more. Goldstein Podiatry offers traditional medical and alternative care, orthotics , bracing, office surgery, X-Rays and Neuro-stimulation for Neuopathy and Iontophoresis. 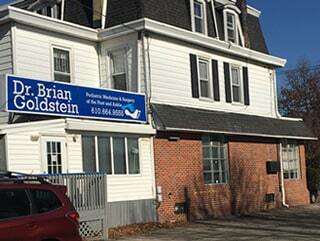 Dr. Brian Goldstein is also an expert foot and ankle surgeon who specializes in surgical procedures for the ankle. From routine checkups to foot surgery, Brian Goldstein, DPM is a podiatrist who is equipped to handle all your foot and ankle needs.